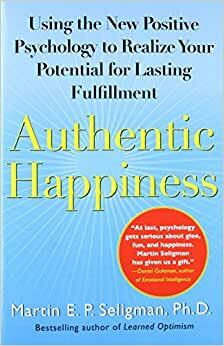 In this national bestseller -- Martin Seligman's most stimulating, persuasive book to date -- the acclaimed author of Learned Optimism introduces yet another revolutionary idea. Drawing on groundbreaking scientific research, Seligman shows how Positive Psychology is shifting the profession's paradigm away from its narrow-minded focus on pathology, victimology, and mental illness to positive emotion and mental health. Happiness, studies show, is not the result of good genes or luck. It can be cultivated by identifying and nurturing traits that we already possess -- including kindness, originality, humor, optimism, and generosity. Seligman provides the tools you need in order to ascertain your most positive traits or strengths. Then he explains how, by frequently calling upon these "signature strengths" in all the crucial realms of life -- health, relationships, career -- you will not only develop natural buffers against misfortune and negative emotion, but also achieve new and sustainable levels of authentic contentment, gratification, and meaning. Caroline Myss Author of Sacred Contracts Authentic Happiness is delightful and richly insightful. Martin Seligman has written a very practical book, guiding readers to make positive choices in life. Steven Pinker Author of The Language Instinct A highly insightful scientific and personal reflection on the nature of happiness, from one of the most creative and influential psychologists of our time. Elle A bold new plan for taking control of your life and finding lasting happiness. My daughter is taking a Positive Psychology Class in college and this is their textbook. She loved it so much she told me to buy and read it. It's very helpful and has given her a great and different perspective on depression and how some of it can be fixed by changing your thoughts. Highly recommend for anyone who wants to see life in a better light and/or anyone with depression. It may not cure you but it's certainly a hopeful and well thought out book that will make a difference. I don't always care for the personal narratives added by Seligman, but they do serve clear and intentional messages. This book is a good reminder of what it means to live with positive intention and mindfulness as well as important statistics and logic regarding positive psychology. Not his best work. The concept is very interesting but he uses the book as a platform to discuss his prior books and overly detailed anecdotes. If you can buy it cheap and used, it is worth perusing.